For Emily Hough-Kovacs, it’s not just about the final product when it comes to music. It’s about the intricacies of production, the record label dealings, and the entire creative and business process. 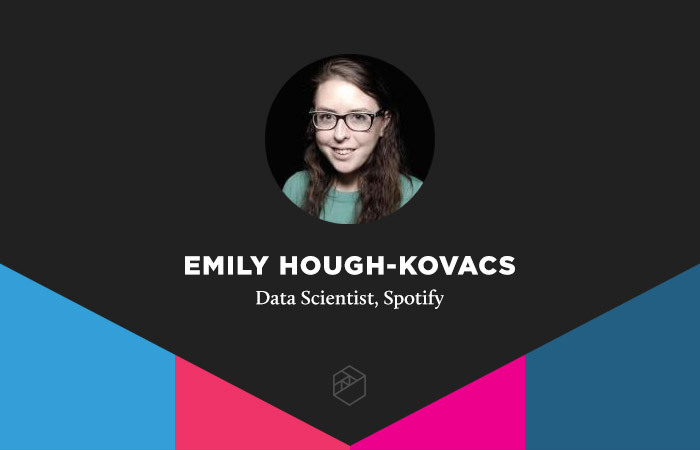 Now a Data Scientist at music streaming giant Spotify, where she works on the Creator Products Insights Team, her daily work aligns with her interest in the creative music process from start to finish – and she’s certainly not alone in that. Her team develops and provides tools for artists, songwriters, producers, and other creators to use for building their careers, thus spurring growth within the music industry as a whole. Data plays a large role in how users discover music and connect with artists on Spotify – and vice versa – and those working with company data certainly have ample material to work with. As of March, 2017, Spotify boasted 50 million paid users with millions more using the service for free (monetized through paid ads), while its music catalog surpassed 30 million songs. It’s impressive to note, then, that Hough-Kovacs is considered the company-wide expert on creator metrics. And communication is key, according to Hough-Kovacs. During her time at Metis, she learned a mix of hard and soft skills – everything from machine learning to public presentation skills – and often finds herself leaning most on the latter. For her final project in the bootcamp, she fused her natural interests in syntax, structure, and language with another passion – hip-hop music. A huge fan of rappers like Nicki Minaj, Drake, and Lil Wayne, as her fandom grew over time, she began to notice she wasn’t just interested in specific artists but also in particular producers. DJ Mustard and London on da Track started to emerge as favorites who had imprints on various songs and albums she adored. She realized she enjoyed the work of these producers and was a fan of them "the same way there were certain artists I'm a fan of," she said. Her project dug into this, using the Genius API to investigate the relationship between artists and producers in hip-hop songs. But even before she started that project, about halfway through her time at Metis, a recruiter from Spotify reached out to her largely because of her frequent bootcamp and project updates published on her blog, Github, and LinkedIn. They spoke casually while she was still a bootcamp student and it inspired Hough-Kovacs to pursue a music-focused final project, which felt like a natural direction for her and certainly helped her in the interview process at Spotify.